From left, school committee chairman Kris O'Brien, superintendent Matthew D'Andrea, committee member Skipper Manter. Should towns have a say in how excess money in the high school budget is spent at the end of the year? The question occupied the regional high school district committee at its meeting Monday evening. In December, the committee voted to spend $350,000 in so-called excess and deficiency (E and D) funds on design work for the new track and field project. But this week, superintendent of schools Dr. Matthew D’Andrea said the committee had bypassed a requirement to seek permission from voters. Mr. D’Andrea said he learned about the requirement while working with attorneys to write warrant articles for annual town meetings this year. E and D funds are money the school has accumulated in previous years through receiving more revenue or spending less than was projected. “The attorney said yes, when you vote E and D, you are voting to spend more money than what the towns approved for you to spend. Therefore you have to go back to the towns and get approval to spend that money,” Mr. D’Andrea told the school committee. The committee took no immediate action, but agreed that the previous vote to spend the money was not valid. Towns will now be notified and the process will start over again. Under state law, towns must be notified of proposed amendments that would increase the overall budget, and given 45 days to call a special town meeting to approve the spending. If no special town meeting is called, approval of the added spending is assumed, Mr. D’Andrea said. He said according to counsel, use of excess funds from previous years should be treated as a budget increase, triggering the requirement. Some committee members expressed surprise at the discovery. “I don’t know why I didn’t find this, I’ve been beating up E and D for years. I’m shocked,” said Jeffrey (Skipper) Manter 3rd, known to be a fiscal watchdog on the committee. Mr. D’Andrea said he had consulted with his predecessor, Dr. James Weiss, about the issue, and learned that past practice has been to use E and D funds without notifying towns. “The practice of this district has always been that it just requires a school committee vote,” Mr. D’Andrea said. He said he had corresponded other regional school district superintendents in the commonwealth and heard back from many who observe the requirement and others who do not. “There are many districts who are doing what we’ve been doing in the past and are still doing it,” Mr. D’Andrea said. The proposed money will go toward design of a new track with a synthetic turf infield surface. For years, the Island community has grappled with the turf question, weighing environmental concerns with athletic preference. The school committee narrowly voted to move forward with the plan that includes one turf field last month. Mr. Manter acknowledged the charged issue. The committee plans to revote the matter at its next meeting on March 25. Towns will have 45 days from the vote to call a meeting — or not. Approval is needed from at least four towns. School business administrator Amy Tierney said the funding delay means she will have to alter a request for proposals for the track engineering work. Committee members also noted that the decision would set a precedent for future budget action. 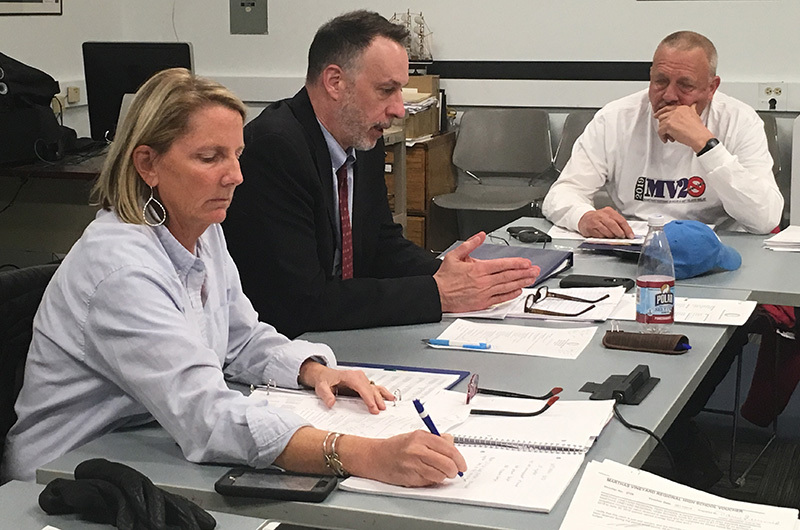 To achieve the flexibility to pay for unforeseen events and emergencies, the committee discussed adding a special emergency fund line item to the high school budget in future years. A proposal to form a high school budget stabilization fund failed at town meetings last April. The superintendent will also request more than $1 million for a high school campus feasibility study at annual town meetings this year. I hope that I am not the only person distressed by Mr. Manter’s comment, “I think in this particular instance, because of the discussion that has gone on in the meetings and stuff, I think we should do the right thing. We don’t want to be challenged.” Mr. Manter, shouldn’t you always do the right thing, regardless of the likelihood of public challenge?